Please see the Instructions For Use that came with your GlucaGen® HypoKit® for complete information. The GlucaGen® medicine comes as a dry powder. Before you use GlucaGen®, you must mix the dry powder with the syringe of sterile water that comes in the GlucaGen® HypoKit®. Do not use any other liquid to mix the medicine. Check that the orange plastic cap on your vial of GlucaGen® is firmly attached. Do not use the vial of GlucaGen® if the orange plastic cap is loose or missing. Step 1. Using your thumb, flip the orange plastic cap off the GlucaGen® vial. Step 2. Pick up the prefilled syringe containing sterile water. Hold the syringe with 1 hand and with your other hand, pull the needle cover off the syringe. Do not remove the plastic backstop from the syringe. Step 3. Pick up the GlucaGen® vial. Hold the vial of dry powder with 1 hand and with your other hand, push the needle of the prefilled syringe through the center of the rubber stopper. Step 4. Hold the vial and syringe together, with the needle still inserted into the vial. Carefully turn the vial and syringe together right side up. Slowly push the plunger down until the syringe is empty. Do not take the syringe out of the vial. Step 5. Hold the entire unit (the vial and syringe) in one hand and gently shake the vial until the powder is completely dissolved. Do not use if a gel has formed, or if you see particles in the solution. Do not take the syringe out of the vial. Step 6. Firmly hold the vial and syringe together, with the needle still inserted into the vial. Carefully turn the vial and syringe together upside down. Gently pull down on the plunger and slowly withdraw all of the liquid into the syringe. Do not pull the plunger out of the syringe. Step 7. Keep the needle inside the vial. Check the syringe for air bubbles. If you see bubbles, tap the syringe until the bubbles rise to the top of the syringe. Gently push on the plunger to move only the air bubbles back into the vial. Step 8. Hold the vial and syringe as shown. The usual dose for adults and children who weigh more than 55 pounds (25 kg) is 1 mg (1 mL). Use the content of the full syringe (1 mL). The usual dose for children who weigh less than 55 pounds (25 kg) is 0.5 mg (0.5 mL). Gently push the plunger until it is at the 0.5 mL mark on the syringe to ensure there is 0.5 mL liquid left in the syringe. Take the syringe and needle out of the vial when the correct dose of GlucaGen® is in the syringe. Give a child under 6 years of age 0.5 mg (0.5 mL). Give a child 6 years of age and older 1 mg (1 mL). Step 9. Choose the injection site. 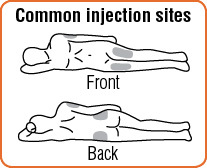 Common injection sites for GlucaGen® are upper arms, thighs, or buttocks. Step 10. With one hand, gently pinch the skin at the injection site. With your other hand, insert the needle into the skin and push the syringe plunger down until the syringe is empty. Step 11. Pull the needle out of the skin and press on the injection site. Throw away your used syringe with the needle attached and any GlucaGen® you did not use. See “How should I dispose of (throw away) used GlucaGen® prefilled syringes” at the end of these instructions. Step 12. Turn the person on their side. When an unconscious person awakens, they may vomit. Turning the person on their side will lessen the chance of choking. Step 13. Call for emergency medical help right away. Step 14. Feed the person as soon as they are awake and able to swallow. Give the person a fast-acting source of sugar (such as a regular soft drink or fruit juice) and a long-acting source of sugar (such as crackers and cheese or a meat sandwich). Step 15. Even if the GlucaGen® treatment wakes the person, tell their doctor right away. The doctor should be told whenever a severe drop in blood sugar (hypoglycemia reaction) happens. The person’s dose of diabetes medicine may need to be changed. Hypoglycemia may happen again after receiving GlucaGen®treatment. How should I dispose of (throw away) GlucaGen® prefilled syringes? Put used syringes in a FDA-cleared sharps disposal container right away after use. Do not throw away (dispose of) loose needles and syringes in your household trash. When your sharps disposal container is almost full, you will need to follow your community guidelines for the right way to dispose of your sharps disposal container. There may be state or local laws about how you should throw away used needles and syringes. For more information about safe sharps disposal, and for specific information about sharps disposal in the state that you live in, go to the FDA’s website at http://www.fda.gov/safesharpsdisposal.